Is NY/NJ Point of No Return for Hanjin Miami? The Port of Charleston’s November volume of full and empty 20-foot-equivalent units rose 6.5 percent year-over-year, reflecting what CEO Jim Newsome said was expected “sustained moderate growth.”..
How is the recent US-Iran deal affecting the current tanker market? The Panama Canal said beginning September 8th it will temporality restrict ships to a maximum of 39 feet due to the drought caused by El Nino. This could affect about 20 percent of the water’s traffic transiting between Pacific and Atlantic oceans. Egypt’s President Abdel Fattah Al-Sisi officially inaugurated the New Suez Canal in the port city of Ismailiya at 2 pm local time today. Teekay Tankers Ltd. has agreed to acquire a fleet of 12 Suezmax tankers currently owned by Principal Maritime Tankers for an aggregate purchase price of USD 662 million. U.S. Port of Brownsville opened the new 600-foot marine cargo dock and storage yard on Friday, August 7, expected to make the port more competitive with domestic and foreign ports in the Gulf region. Hundreds of tons of marine debris have been collected from the shores of Alaska and British Columbia as part of an unprecedented cleanup effort that an organizer says barely made a dent in the rubbish that remains on beaches. American President Lines (APL), a subsidiary of Neptune Orient Lines, and SeaLand, a division of Maersk Line, have announced the formation of a Vessel Sharing Agreement (VSA) that introduced a new weekly service branded the ACX by APL and the NAE by SeaLand. Although there are still some lingering congestion issues, retailers and logistics services providers are working together to ensure imports flow smoothly to store shelves. The nuclear accord reached in Vienna on Tuesday could eventually reshape global oil markets. After almost two years of talks, the holder of the world’s fourth-biggest crude reserves will benefit from an easing of international sanctions on exports in return for curbs on its nuclear program. How Much More Oil Can Iran Produce? The discount of delivered RMK 500 CST bunker fuel to RMG 380 CST bunker fuel in the Rotterdam region has fallen to a 23-week low on adequate availability, scarce demand and high level of competition, sources said Tuesday. A niche liner service linking Europe with the Great Lakes port of Cleveland has quadrupled its container volume since adding a second monthly sailing, and port officials say the fledgling operation is starting to catch on. The Port of New York and New Jersey handled record import container volume in May, the latest sign that diversion from West Coast ports is lingering months after their congestion cleared. The federal agency that oversees the safety of the nation’s pipelines failed to follow through on congressional reforms that could have made a difference in a May break that created the largest coastal oil spill in California in 25 years, a House committee chairman said Tuesday. The IMF expects economic growth will continue and recommends that the authorities take advantage of the benign inflation level to suspend price controls. APM Terminals outlined its plans to prepare for growth at the Port of Mobile with expansion of the terminal’s container yard and the addition of two cranes. APM Terminals Mobile is investing $40 million in infrastructure to expand its container yard by 20 acres and add two super-Post Panamax STS cranes to the terminal. The membership of ICS, which comprises national associations from 37 countries (including the newly-admitted Russian Chamber of Shipping), reviewed important regulatory and policy developments affecting global maritime trade. On Friday, the IMO adopted globally binding regulations for ships using LNG as fuel. The newly updated international code, the IGF Code, covers the safety of ships using gases or other low-flashpoint fuels and is designed to ensure that the safety level of ships using LNG and other more environmentally friendly fuels is enhanced and made more homogeneous. Additional workers will be used to run second yard shifts, execute rail movements, and bolster equipment operations, according to a statement from the New York Shipping Association. The Port of New York and New Jersey will add a 161 longshoremen in the coming months. Nor-Shipping saw a number of innovations for improving the energy efficiency of container ship designs, but with low fuel prices and the latest spending spree on mega-container ships, the industry is undergoing a shift that may see a stall in the benefits shipowners will gain for their efficiency dollar. Engineers began flooding a newly enlarged section of the Panama Canal on Thursday as authorities prepare to test a series of new locks that will allow the waterway to accommodate much bigger ships, affecting trade around the world. U.S. shale oil producers, having weathered the worst price plunge in their industry’s brief history, now face a dilemma: whether to stay in a defensive crouch after slashing their rig fleets, or start drilling more wells to capture a partial recovery in prices. The Army Corps of Engineers has approved an additional $62.5 million in funding for the Delaware River 45 foot Main Channel Deepening project. Congress had already approved $35 million for the project in the 2015 Corps budget. A new bill introduced on Wednesday seeks to lift the over 40-year ban on the export and sale of U.S. crude oil outside of the country’s borders. Senators Heidi Heitkamp and Lisa Murkowski of Alaska are the sponsoring the legislation, which will reclassify crude and condensate oil – a light petroleum oil – so that they can be exported freely without licenses from the Commerce Department. A roundtable (RT) of international shipping organizations (comprising BIMCO, the International Chamber of Shipping, Intercargo and Intertanko) has announced it is “deeply concerned” if the international convention to regulate ships’ ballast water comes into force soon without a realistic implementation schedule that recognizes the timetable for US type-approved ballast water management systems (BWMS) to be available in sufficient quantities. Congestion on the West Coast has triggered huge eastward shifts in ocean traffic, and long-term factors will sustain the shift. For brief periods during the past week, no ships arriving at the adjoining ports of Los Angeles and Long Beach had to sit at anchor and wait to be unloaded. It’s a sign that the epic congestion that turned America’s largest port into a three-thousand-acre logjam for nearly eight months is finally ending. Panama’s Cabinet has officially approved a proposal to modify the Panama Canal tolls structure, following a recommendation from the Panama Canal Authority (ACP) Board of Directors. The newly approved toll adjustments for all market segments are scheduled to enter into effect on 1 April 2016. With America’s population expected to grow by 70 million over the next 30 years, moving the goods that enrich our lives – and the freight that fuels our economy – will be a key challenge. As our Beyond Traffic draft framework indicates, by 2045, the volume of goods on our roads, rail, air, and water will increase 45 percent or more. The Port of Miami’s Deep Dredge project was initiated to accommodate the influx of Post-Paramax vessels that will be using the new Panama Canal. Recently, a government-sponsored dive exposed additional dangers to the endangered corals near the dredge site, which are dead or dying. The U.S. Coast Guard (USCG) Tuesday issued a safety alert on fuel switchover procedures, citing a number of incidents involving machine space oil leakages. The US Energy Information Administration on Tuesday nearly tripled its forecast for the 2015 Brent-WTI spread to $7.35/b, largely due to a glut of US crude production. At least three refineries that account for more than two-thirds of the U.S. East Coast’s output experienced significant disruptions on Friday due to single-digit temperatures that sent the entire Northeast into a deep freeze. The ongoing labor dispute in U.S. West Coast ports is expected to lead bunker suppliers seeing weakened demand as congestion builds and shippers make arrangements to use other ports, Platts reports. Work on the Nicaragua Grand Canal has started but its construction has raised questions because of the lack of an environmental impact review, says a report. Bunker quality is improving, says the International Bunker Industry Association (IBIA). Liner operators transiting the enlarged Panama Canal are set to be incentivized to use their largest boxships. Bunkers International said Thursday it and partner CI Vanoil have launched a 0.1%S fuel oil-based product in Cartagena, Colombia, designed to meet stricter sulfur restrictions that went into effect at the beginning of the year. The bill proposes taxing LNG on energy output rather than per gallon, especially as LNG creates less power per gallon than diesel. Price predictions for crude have taken another cut but are well above current prices and oil markets are already looking to be significantly tighter in the second half of this year as the “moderation” in US shale oil takes effect, say analysts. Cuba’s improved relations with the United States could lead to a more rapid expansion of the port upon which the country has staked much of its economic future, an executive whose company built the port said on Friday. Panama transshipment activity is expected to jump by double digits after the new Panama Canal locks open in 2016 and will be followed by longer-term annual growth of about 5 percent, Drewry Maritime Research said in the latest issue of its Container Insight Weekly. Shipowners are choosing marine gas oil (MGO) over “boutique“ ultra-low sulphur fuel oil material to fuel vessels sailing in US emissions control areas (ECAs), a report suggests. Owners and operators may be tempted to keep aging ships around to take advantage of cheaper bunkers. Rising costs associated with new Emissions Control Area (ECA) rules are expected to hasten the consolidation in Northern European short-sea and feeder markets, JOC reports. No one wants to make a crisis out of a drama but it is hard for offshore specialists not to panic about the price of oil. The Panama Canal Authority (ACP) has announced a proposal for a new toll structure, as exclusively revealed by Seatrade Global on Monday, and is inviting formal comments on the tolls. International accountant and shipping adviser Moore Stephens says shipping needs to adopt a can-do attitude in order to successfully meet the challenges which are likely to come its way in 2015. The Panama Canal’s expansion reached a milestone on Monday with the installation of the first gate for the new locks. The United States Congress last week enacted the strongest statement of support for the Jones Act and the American domestic maritime industry since the Merchant Marine Act of 1936. The measure was included as part of the National Defense Authorization Act (H.R. 3979), which noted that the national security benefits of the domestic maritime industry and the Jones act are “unquestioned.” The bill states that the Jones Act and the American domestic maritime industry are vital to “the national security and economic vitality of the United States and the efficient operation of the United States transportation system.” The legislation has been approved by the U.S. House of Representatives and the Senate and is expected to be signed into law by the President. A growing number of equity analysts believe lackluster freight rates will continue to plague many publicly-traded bulker owners in the coming year. In reviewing the proposed $1.01 trillion Consolidated and Further Continuing Appropriations Act of 2015 hammered out in Congress late Tuesday, the American Association of Port Authorities (AAPA) noted that there are significant increases for the U.S. Army Corps of Engineers’ Harbor Maintenance Tax (HMT) operations and maintenance (O&M) activities and construction budgets, and for the Environmental Protection Agency’s Diesel Emissions Reduction Act (DERA) grants program. While the Department of Transportation’s TIGER (Transportation Infrastructure Generating Economic Recovery) grants program will drop to $500 million compared with fiscal 2014’s $600 million mark, funding is still significantly higher than the House-proposed mark of $100 million. Emissions such as carbon dioxide and mono-nitrogen oxide that emit from cargo ships are expected to quadruple by 2050. What Are the Three Keys to Operational Success in Shipping? ‘Innovation, reliability and cost-efficiency,’ says MacGregor in this post, which takes a closer look at the systems installed on two new 20,000 dwt multipurpose vessels owned by Rickmers Group. A drastic shift in the paradigm for selecting routes transiting sulfur emission control areas is nearly upon us. With fuel differential costs between IFO and Ultra Low Sulfur fuel on the order of USD 300 to 400 per ton, the methodology for voyage planning will enter a completely new realm as of January 1, 2015 when ECA zones have stricter regulations. Shipping freight rates from Asia to Europe, the world’s busiest trade route, on Monday logged their biggest-ever weekly drop, as European growth is stagnating and Japan just fell back into recession. A just-released study commissioned by the Pacific Maritime Association argues that West Coast ports stand to lose significant volumes of cargo in the years following the Panama Canal expansion due to lower freight rates that will be offered on all-water Asia to East and Gulf coast services. Some shippers with sensitive cargo are diverting containers away from the U.S. West Coast to the port of Virginia, despite higher transportation costs, to avoid congestion and potential labor action. Ecuador and Venezuela plan to present a joint proposal at the next meeting of the Organization of the Petroleum Exporting Countries that will “imply” cutting some production, President Rafael Correa said. The Worldscale Association has announced bunker prices and fixed rate differentials for 2015, which will help deal with the issue of higher freight costs resulting from changes to Emission Control Area regulations. European shipowners are to study the impact low sulphur bunker demand will have on the market. The US ports of Los Angeles and Long Beach recently reached six-month highs for vessel arrival delays and berth times amid increased congestion in Southern California, according to shipment management software company CargoSmart. The Worldscale Association has announced new bunker prices and fixed rate differentials for 2015, which will help deal with the issue of higher freight costs owing to the upcoming Emission Control Area regulations. The International Bunker Industry Association (IBIA) is calling on the International Maritime Organization (IMO) to create legislation that will ensure a “decent and honest” bunker market. IBIA Chairman Jens Maul Jørgensen told maritime news provider ShippingWatch that the quality of supplied bunkers is continuing to decline. He added that a majority of the global fuel suppliers fail to comply with the standards adopted in 2010 (ISO 8217:2010) and are still using outdated standards. The Port Authority of New York and New Jersey expects within the next couple of weeks to announce details of its “winter plan” to avoid a repeat of the gridlock that crippled the East Coast’s largest port last January and February. The manufacturing sector, already a leading component of the U.S. economy, would benefit significantly if the crude oil ban were lifted, according to a new study. Global cloud software company Inatech has launched ECA Complaince, a rules based application and reporting tool that gives ship operators the information and reports needed to demonstrate continuous compliance with the 2015 ECA regulations. Officials of the Philadelphia Regional Port Authority (PRPA) today released a Request for Expressions of Interest (R.E.I.) for the development of its Southport Terminal Complex, located on the Delaware River in South Philadelphia. An industry committee hopes to agree by mid-2015 on a plan for interchangeable “gray” chassis in the Port of New York and New Jersey, a port authority official said. The northwest European fuel oil Calendar 2015 hi-lo swap – the premium of 1% FOB NWE cargo swaps over 3.5% FOB Rotterdam barges – has hit a record low ahead of new rules next year that will limit bunker fuel sulfur levels in emission control areas to 0.1%. Georgia port and state officials have signed a partnership agreement with the Army Corps of Engineers that allows work contracts to be awarded for deepening of Savannah’s port channel to 47 feet. Container volumes in Los Angeles-Long Beach were flat in July as uncertainty about the International Longshore and Warehouse Union contract negotiations resulted in cargo diversion to East Coast ports. In an effort to step up enforcement of the North American Emissions Control Area (ECA) rules, US authorities have boarded vessels to collect bunker samples and is experimenting with vessel flyovers to test smokestack plumes, the UK P&I Club says. The marine industry is increasingly exposed to the kind of complexity and regional variation in exhaust emissions legislation to which road transport sectors have been subject for some time. They include international requirements on air pollution emissions under Annex VI of IMO’s MARPOL Convention and additional regional and local regulations applied by bodies such as the European Union, the California Air Resources Board’s OGV regulations. Canals used to be a sleepy topic. As a news organization, you could count on little or nothing to report. Once in a while, a drought would restrict drafts at the Panama Canal, or wait times would spike temporarily, but that was about it. Suddenly, times have changed. Philippine authorities were working with U.S. officials to get shore leave for 17 Filipino seafarers aboard the “Nikol H” which has been stranded for months in Philadelphia due to mechanical and financial problems. The men were in good spirits and have been receiving pay despite not being allowed off the vessel. U.S. Customs and Border Protection won’t allow the mariners to go ashore without proper visas. But the agency will consider any requests for humanitarian parole. The flexibility of coated Aframaxes (LR2s) has the ability to change this sector’s supply balance. With around 27.5% of the Aframax fleet being coated, owners have the option to switch to clean trades when market conditions dictate. The two classes are therefore inextricably linked, said EA Gibson in a report. Libya, having seen its output flounder at low levels of around 200,000 b/d in recent months, is now seeing production rise again after a series of agreements with the various tribes and factions that have occupied fields and facilities and blocaded ports for more than a year. Production is now around the 600,000 b/d level. Norfolk – The Port of Virginia set a new mark for TEU volume in fiscal 2014 having handled more than 2.3 million TEUs in the twelve months that closed June 30, and eclipsed the previous fiscal year record by 140,476 TEUs. Leaders of an industry group that proposed far-reaching changes to operations of the Port of New York and New Jersey are starting the more difficult task of deciding how to turn those recommendations into reality. The announcement was made at a press conference attended by Governor Chris Christie, Senate President Stephen Sweeney, the Board and staff of the South Jersey Port Corporation, various Gloucester County executives and representatives of Holt Logistics at the future site of the facility, located at the former Paulsboro BP refinery on the banks of the Delaware River in Paulsboro, Gloucester County. Norway’s civil defence authorities are conducting an investigation into a serious leak of LNG that occurred during truck-to-ship bunkering operations involving a cruise ferry last month. Worcester, Mass. – Heating oil buyers in Massachusetts, Vermont, New Jersey, Rhode Island and Connecticut are expected to see a significantly higher price on July 1, following the planned switch to the new 500-ppm maximum sulfur content heating oil from 2,000 ppm high-sulfur heating oil, according to some major heating oil suppliers. Maersk, CMA CGM and MSC have abandoned plans for their potentially game-changing P3 Network after China refused competition clearance. The merger had been widely tipped to win Chinese backing following approval from Europe and the US, but in a shock announcement on Tuesday, the country's ministry of commerce said the huge alliance may eliminate or restrict competition in the Asia-Europe market. Enforcement of ECA Rules is "the Real Issue"
Container import volumes at US ports are expected to see a significant jump this month, a trade body has forecast. The National Retail Federation (NRF) expects volumes to increase by 7.5% this month due to the threat of a potential strike by dockworkers. It retailers are expected to bring "unusually high quantities of merchandise" into the country early to avoid any potential disruptions after the labor contract with West Coast dockworkers expires. Approval for an alliance of the world’s three biggest container lines is likely to be delayed until the third quarter of 2014. The so-called P3 alliance – made up of Maersk, CMA CGM and Mediterranean Shipping Co – has already won approval from the US Federal Maritime Commission. But it still needs the backing of regulatory authorities in China and Europe. “We did expect to get the European and China approval before or around the middle of the year and we still expect that, but there are a number of jurisdictions, smaller jurisdictions, that we would like to have in place before we put the network in place, and they may take a bit longer,” said A.P. Moller-Maersk Chief Executive Nils Smedegaard Andersen on Wednesday. The alliance will allow the partners to cut costs by using one another’s ships and port facilities. The plans, however, have faced opposition. At one stage bunker players were concerned that they wouldn’t be able to negotiate separately with each of the three partners. The dramatic surge in the number of container ships scrapped in recent months is set to continue but will have minimal impact on the oversupply of vessels in the key East-West trades, according to Drewry Maritime Intelligence. Most of the ships sailing to demolition yards so far remain below 6,000 20-foot-equivalent units, whereas the worst excess of supply over demand is in the 10,000-TEUs-plus sector, which is mostly deployed on the Asia-Europe routes. As a result, unwanted ultra large container ships will continue to be “cascaded” into other routes, maintaining pressure on ocean freight rates, the London-based analyst said. Of the 73 vessels scrapped in the first four months of 2014, only seven were post-Panamax ships between 5,000 and 5,999 TEUs, with the remainder below 4,999 TEUs; that mix is little changed since 2011. The average size of ships scrapped has been rising, however, climbing from 1,293 TEUs in 2011 to 2,855 TEUs in the first four months of 2014. “In other words, only vessels deployed in fast-growing North-South and intra-regional trades are being scrapped, which is not immediately relevant to East-West services,” Drewry noted. 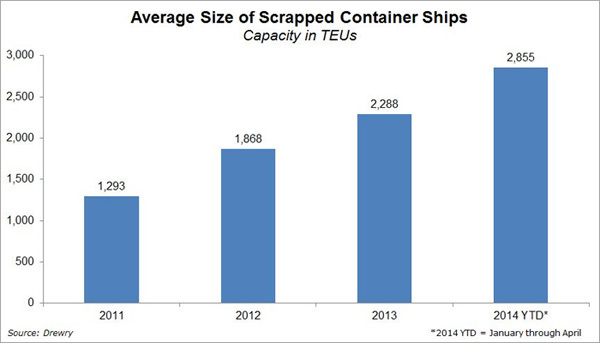 The average size of ships scrapped climbed from 1,293 TEUs in 2011 to 2,855 TEUs in the first four months of 2014. Moreover, the volume of capacity being scrapped still remains small compared with the total fleet capacity, and even if the current rate of scrapping continues for the rest of the year, it would remove less than 4 percent of global cellular capacity. Scrapping has offset 40 percent of vessel capacity growth this year, as the world fleet is expected to grow by 5 to 6 percent and cargo will increase by less than 5 percent. But this overlooks the uneven way excess capacity is being delivered, Drewry points out. Just over 50 percent of all new capacity that has entered service since 2011 has been provided by ships over 10,000 TEUs deployed on East-West trades. The average provided by ships below 5,000 TEUs, where scrapping is concentrated, is just 17 percent. Also, the capacity of all ships scrapped last year roughly equates to the new capacity injected by vessels below 6,000 TEUs. This situation is not expected to improve any time soon, as 55 percent of all capacity on order through the end of 2016 consists of vessels over 10,000 TEUs, and the world fleet is projected to grow by 20 percent during the period, ignoring further scrappings and delivery postponements. While some of the ships between 6,000 and 9,000 TEUs that the new vessels will displace will quickly fit into North-South trades, the majority will be kept out due to draft restrictions in Africa, India and South America. The two major US west coast ports have both seen April container volumes increase by 10% compared to a year ago. Los Angeles, which is the largest container port in the Americas, saw volumes of 706,036-teu in what was its busiest month since September 2013. Container imports rose 11.4%, from 486,910-teu in April 2013 to 537,071-teu last month. Exports rose 8% to 172,945-teu. For the first four months of the calendar year overall volumes have increased 8.2% to 2.6mteu compared to the same period in 2013. Cargo numbers for containers at the Port of Long Beach were up in April by 9.7% overall, compared to the same month one year ago. “Following a slow March due to the harsh winter in other parts of the country, April container volumes rebounded as weather patterns and shopping patterns returned to normal,” Long Beach said. A total of 569,843-teus moved through the port during April, with imports up 11.9% to 295,712-teu and exports up 6.3% to 146,498-teus. “Following a weak first quarter here, overall volume for the first four months of 2014 is up just 1% compared to the same period last year,” Long Beach said. Last year, against which 2014 is being compared, was the third-busiest year in the port’s history with a total of 6.73mteus. The shipping industry’s current focus on fuel efficiency and emissions reduction is raising many major questions, according to a roundup of class society experts by industry news site MarineLink. James Watson of ABS said that, while class societies traditionally focused on the structural safety of ships, they must now consider hull forms, fuel choices, and equipment. “Arriving at the most efficient vessel requires looking at the hull and the associated appendages – propeller, rudder, energy saving devices, bulbous bow (or no bulb) – as a complete and integrated system,” he said. Philippe Donche-Gay of Bureau Veritas (BV) said larger ship sizes demand new tools for analysis, as does the adoption of liquefied natural gas (LNG) bunkers. “We see an accelerating move to use LNG as a fuel at sea and we are working hard with shipowners and gas suppliers to facilitate that transition,” he said. Several other class society experts also noted the industry’s need for support in negotiating challenges around LNG bunkering. “As we see this trend grow, DNV GL is working to ensure that owners can be confident that the technology is vetted, operational practices such as bunkering and crew training are in place, and the supporting infrastructure is meeting stringent safety standards,” said Paal Johansen of DNV GL. Johansen also said the industry is likely to see other innovations as it works to reduce pollution and improve efficiency. “The stricter environmental regulations and rising fuel costs lead to technology development in design, size, propulsion and operations,” he said. Shippers surveyed by Wolfe Research in March and April on average expect their volume to rise 3.6 percent over the coming year – the rosiest forecast since 2010. They expect railcar and intermodal growth to drive total freight volume, with each expanding 5 percent over the next 12 months. Domestic ground and ocean shipping traffic will expand on average 3 to 4 percent in the same period, shippers said. There are also positive signs for restocking and accumulation of inventory. About half of the 100 shippers surveyed said they are planning for more shipping activity, compared with only a quarter of them who said that three months ago. However only 16 percent said inventory stocks were somewhat or materially below targeted levels. The increase in shipping activity is set to kick into higher gear in the second half of 2014, thanks to pent-up demand following a brutal winter and acceleration of importing ahead of potential labor disruption at West Coast ports, according to the New York-based investment research firm focused on transportation. Sixty-three percent of surveyed shippers plan to make up for volume lost in the winter, while 37 percent think that traffic is lost completely, and 17 percent didn’t see their loads suffer at all. About half of the respondents have plans to accelerate imports, or are already doing so, due to fears the International Longshore and Warehouse Union will disrupt supply chains while negotiating with waterfront employers over a new labor contract that expires on June 30. More than half of the shippers surveyed are also planning to divert cargo to ports outside the U.S. West Coast, with East and Gulf coast ports the favorite (85 percent), followed by Canadian ports (55 percent). None of the shippers plan to divert imports through Mexican ports, a result of the extra sailing days from Asia and the higher cost of moving freight inland to the U.S. The forecasted ramp-up in shipping activity isn’t ballooning shippers’ budgets, however. The shippers – whose transportation budgets total more than $17 billion – expect their transportation spend to expand 2.5 percent, a decrease from the 3 percent pace they expected last quarter. The pullback in forecasted budget growth is largely because of lower year-over-year fuel surcharges and shippers’ belief that pricing growth will slow for most modes. Truckload pricing is the exception. Shippers are gearing up for truckload pricing to rise 2.4 percent over the next 12 months, a 1.9 percentage point increase from when they were surveyed last quarter. Shippers’ truckload pricing expectations are the highest they have been in two years, after those surveyed saw rates rise on average 3.6 percent in the first three months of 2014. Maersk Line retrofitted nearly half its owned containership fleet last year, with the company seeing major fuel and emissions savings from what it describes as “bundled retrofits”. Jacob Sterling, head of sustainability for Maersk Line, told a media briefing on Monday that it retrofitted 137 containerships in its fleet last year. “We have always done retrofits but I think what is new in 2013 is we were beginning to bundle the retrofits. So you take the ship out of service and we do multiple retrofits,” Sterling said. These could involve changes such as replacing the bulbous bow, elevating the navigation bridge, and making modifications to the engine room. Sterling said that such “extreme makeovers” could result in efficiency gains comparable to buying a new eco-ship, with an efficiency gain of 15 – 20%. “One of these big retrofits will typically cost between $5m – $10m, the pay back time is usually one to two years,” he said. The short pay back time means the company has even retrofitted some of its chartered vessels. Of the 137 vessels retrofitted in 2013, 16 where on charter to the Danish company. “If we have three or four years left on a charter hire it makes perfect sense to pay for an upgrade as we will save on fuel costs,” Sterling said. Of its total owned fleet of roughly 250 ships, Maersk Line has retrofitted about 200, while the company has similar number of chartered-in vessels as well. Sterling believes retrofitting will be a continuous process with vessels undergoing second retrofits as new technologies are developed. Retrofits are part of how the company says that, according to its own estimates, it saved its customers 2.6m tonnes of CO2 emissions last year, when compared to the industry average. This comes at a time when the line is seeing an increased demand for sustainability information, particularly from large shippers. Maritime services firm Crowley Maritime Corp has acquired majority ownership of Accord Ship Management (HK) Ltd and Accord Marine Management in a deal announced on Monday. Accord currently manages 23 vessels and has offices in Hong Kong, India, and the Netherlands. The acquisition will result in a combined fleet of over 60 vessels managed for third-party owners, Crowley said in a statement. The deal immediately increases the size and scope of Crowley’s technical ship management group, and helps it create a greater presence outside of the US, the Florida-based firm added. The 2013 financial reporting season for container lines ended for many carriers in a sea of red ink as high bunker prices and weak freight rates combined to drag down profits. But some of the biggest carriers, particularly Maersk Line and CMA CGM, are clearly bucking that trend, indicating that carriers operating large ships within extensive service networks are at a clear financial advantage. The results thus show that some carriers are better prepared than others to withstand the pressures of overcapacity that are expected to remain through at least 2015. Maersk Line generated EBIT of $1.57 billion last year and $525 million in 2012, while CMA CGM generated $756 million in EBIT last year and $1 billion in 2012, according to financial data compiled by SeaIntel. MSC does not report its financials publicly. That compares with 2013 operating losses of $395 million at China Shipping Container Lines, $285 million at Hanjin Shipping and $238 million at CSAV. APL showed a $231 million EBIT loss last year. The largest loss last year was experienced by the Israeli carrier Zim, which added a $530 million net loss to a loss of $428 million in 2012. The carrier is embarking on a restructuring plan involving a new ownership structure that it claims will “dramatically” improve upon total losses of almost $1.4 billion accumulated over the past three years. “We find that six carriers have posted significant financial losses from 2011 and onwards – APL, Cosco, CSAV, Hanjin, MOL and Zim – whereas both Hapag Lloyd and OOCL have presented positive EBIT results in the same period,” SeaIntel said. Even among those carriers, ship size made a difference. “In terms of total fleet, OOCL is not in the Top 5, but its average size per vessel makes them more profitable than many of the rest,” Paul Wan, head of Asia transport research for CLSA, told the JOC. Wan said this was a key element to consider when assessing the shipping companies’ performance, but it was not just the "big three" lines that benefited from economies of scale. This drive to improve profitability by boosting vessel size is critical, even though those analyzing the market believe it will continue to exert downward pressure on freight rates until supply and demand are more in balance. “Many carriers have been through restructuring and refinancing, but still the orders were being made as they simply have to order bigger vessels to compete” with the Maersks of the world, Wan said. What is happening is that carriers are charting their own course, seeking reduced costs through larger ships, without regard to its impact on the broader market. “We continue to see orders for large vessels, impeding the progress towards a supply-demand equilibrium environment and thus pricing power,” said Michael Beer, vice president for Asia-Pacific research at Citi. The race to be competitive in ship sizes is well under way. More than 82 percent of the current order book is for vessels of more than 8,000 TEUs, Drewry told the JOC’s TPM conference last month in Long Beach, Calif.
“We expect that the volatility in freight rates on Asia-Europe will continue in 2014, and as a lot of vessels from Asia-Europe will be cascaded into the trans-Pacific, we fear that the volatility in freight rates can be transferred to that trade too,” SeaIntel said. Long-time Hong Kong-based transport analyst Charles de Trenck said before there could be a rebalancing of supply and demand, excess tonnage had to be taken out of service. “We have to see scrapping on the order of 1 million 20-foot containers per year for awhile in order to clear the excess tonnage,” he said. Bringing down unit costs and improving revenue per container is important, but with gross supply double that of demand, removing greater quantities of the surplus tonnage had to happen, de Trenck said. Wan pointed out that the number of deliveries of mega-ships would peak this year, and the supply-demand balance would be similar to that of 2013, but he agreed that larger vessels cascaded into smaller trades would ensure volatility would remain in the market and that many GRIs would not be sustainable. Volumes are expected to increase by 6.1% this month according to the National Retail Federation (NRF). "A busy time is expected over the next few months, so retailers are keeping a close eye on the labour situation at West Coast ports to ensure that cargo continues to move smoothly," NRF said. The current contract for West Coast dockworkers expires June 30 but negotiations are not expected to begin until mid-May. “Companies are already exploring contingency plans in case of a disruption,” said the Washington-based NRF. US ports handled 1.26mteu in February, the latest month for which after-the-fact numbers are available. February is historically the slowest month of the year, and the number was down 8.4% from January and 1.4% from February 2013. March was estimated at 1.31mteu, up 15% from the same month last year. April is forecast at 1.38mteu, up 6.1% from last year; May at 1.44mteu, up 3.8%; June at 1.43mteu, up 5.5%; July at 1.49mteu, up 3.1%, and August at 1.51mteu, up 1.2%. The first half of the year is expected to total 8.2mteu, up 5.5% over last year. The total for 2013 was 16.2mteu, up 2.3% from 2012’s 15.8mteu. The import numbers come as NRF is forecasting 4.1% sales growth in 2014, contingent on how Washington policies on economic issues affect consumer confidence. “There is positive news with both the rebound in US retail sales in February and the new filings for jobless benefits hitting a fresh three-month low last week, suggesting that the economy is gaining momentum,” the NRF said. The NRF report covers the US ports of Los Angeles, Long Beach, Oakland, Seattle and Tacoma on the West Coast; New York, New Jersey, Hampton Roads, Charleston, Savannah, Port Everglades and Miami on the East Coast, and Houston on the Gulf Coast. Virginia Gov. Terry McAuliffe said the state port authority’s operating losses must end, and that he plans “some very substantial changes” to the port board and wants to renegotiate its 20-year lease of APM Terminals’ Portsmouth facility. McAuliffe’s blast, reported by the Virginian-Pilot, came in response to questions during during a talk last week to the Hampton Roads Chamber of Commerce. The Virginia Port Authority has been scrambling to end congestion and slow truck turn times resulting from higher volume, larger ships and winter weather. An industry task force was created in February to find solutions to operational problems. He said the port had lost $120 million during the last five years. That is about $34 million more than the $85.8 million the authority reported losing over the past five fiscal years, according to a slide included in a State of the Port presentation in February. “Additional work that was supervised by (Transportation Secretary Aubrey Layne) showed that there was actually a larger cash deficit over the past five years than was initially presented,” Rachel Thomas, a spokeswoman for the governor, wrote in an email to the Virginian-Pilotl. The port is projected to lose up to $23.4 million for the current fiscal year that ends June 30, though Layne and port officials say they believe the loss won’t be that high. McAuliffe said that in addition to “gigantic losses,” a confidential review of the port’s finances that he ordered showed the port was not meeting its debt covenants. The governor’s office later said the debt-coverage issue had been addressed, the Virginian-Pilot reported. McAuliffe said John Reinhart, who took over as the port authority’s executive director on Feb. 10, was doing a “spectacular job” but has a tough assignment. Virginia’s container volume rose 5.6 percent last year but the port has posted operating losses. GTT North America (GTTNA), a U.S. subsidiary of Gaztransport & Technigaz (GTT), has received approval in principle from ABS for the design of a 2,200 cubic meter LNG bunker barge. The distinctive design incorporates GTT’s proven membrane Cargo Containment System (CCS), which is utilized in 70% of the global LNG carrier fleet and nearly 90% of LNG carrier projects on order. GTT developed the membrane LNG bunker barge to demonstrate the efficient storage of LNG and safe, reliable management of Boil-Off Gas (BOG) in an unmanned push barge application. The barge was designed for use in bunkering operations including ship-to-ship LNG transfers or LNG bulk transport in US inland waterways, harbors, and intra-coastal service. The barge could operate as a mobile refueling resource or be moored temporarily to serve as a refueling station. The GTT membrane LNG bunker barge will be capable of loading 2156 m3 (at 98%) or 570,000 gallons within 4.5 hours and towed at maximum speed of 8 knots in an efficient footprint: 64.2 m (212 ft) overall length, 14.8 m (48.5 ft) breadth, 7.2 m (15.7 ft) depth, and 2.6 m (8.5 ft) fully loaded design draft. The dimensions and a gross tonnage of approximately 1,440 GT afford the GTT membrane LNG bunker barge greater maneuverability and access throughout inland and intra-coastal waterways. “This barge design, now approved in principle by ABS, provides a robust solution for boil off gas management, an essential requirement for any atmospheric LNG storage system. The design is a major step forward in bringing the coldest cargo with the highest stored energy value to the US LNG fuel market in a safe manner,” said Allyn Risley, Chairman, GTT North America. Herbert Engineering was commissioned to develop the hull and preliminary machinery design scope and CH-IV International to develop the cargo handling system (CHS) design scope. ABS Consulting also assisted in the development of the GTT membrane LNG bunker barge project. Terminals of Blackwater Midstream Holdings bought for $60 million. New York-listed American Midstream Partners (AMP) ended 2013 in deficit. It recorded net loss of $34 million last year, a worse result from 2012 when the firm recorded a $6.5 million loss. However, revenue was up from $194.8 million to $292.6 million over the period. The firm noted it bought Blackwater Midstream Holdings (BMH), a developer and operator of terminal storage facilities that stores a range of products, including bunker fuels for $60 million in December 2013. BMH operates has 1.3 million barrels of storage capacity across four terminal sites in Westwego, Louisiana; Brunswick, Georgia; Harvey, Louisiana; and Salisbury, Maryland. The acquisition of BMH, along with other firms, will allow AMP to diversify its cash flow, and increase its fee-based gross margin, according to Steve Bergstrom, CEO of the firm. The firm will be, “focused on making 2014 a productive year for the Partnership”, says Bergstrom. The crisis in Crimea could have a significant impact on the tanker market if Ukraine and other European nations end up reducing their reliance on Russian crude, a leading investment bank told clients Monday. RS Platou believes VLCCs would cash in if trade barriers take root. In a daily market briefing RS Platou Markets reminded clients that Russia is now the second largest exporter of crude oil in the world and ships a significant number of cargoes through ports in the Black Sea, which is at the centre of the current conflict. “Europe has the shortest average import distance for oil of any major importer, by far,” it said. “Alternative supplies to Europe would be three to four times the distance if sourced from West Africa and Iraq (crude oil) and the US and Middle East (products). “We estimate 1 mb/d (million barrel per day) shift in crude exports from Russia to West Africa and Middle East would boost fleet utilization by about 3%, lifting VLCC rates from around $30,000 per day to approximately $60,000 per day on an annual basis. On Friday US tanker broker Poten & Partners issued a weekly market note in which it pointed out that the region’s crude trade is currently dominated by aframaxes and is already known as a particularly volatile area in terms of day rates. The firm admitted that the full extent to which the conflict will impact natural gas and oil supplies is not yet clear but warned that the ramifications for the tanker market “will likely be significant” if trade barriers take root. Aframaxes trading spot were seeing day rates of nearly $60,000 just last month in the region but are now fetching between $10,000 and $15,000, which illustrates the persistent volatility in this corner of the market even in the absence of a political crisis. If the cost of Russian crude were to rise and grades of oil became competitive in the European refining system the brokerage acknowledged that replacement barrels from places like West Africa or the Caribbean would likely have a positive impact on ton-miles. Many U.S. East Coast and Gulf ports will struggle to handle the larger container ships the P3 and G6 carrier alliances likely will deploy on trans-Atlantic routes, according to Drewry Maritime Research. The alliances’ consolidation of services means much larger ships could replace the 3,500- to 6,500 TEUs vessels currently deployed, “subject to USEC/USGC ports being able to handle them satisfactorily,” the London-based analyst said. The P3 members – Maersk Line, Mediterranean Shipping Co and CMA CGM – and the G6 partners – Hapag-Lloyd, OOCL, NYK, Hyundai Merchant Marine, APL and MOL – plan to launch their services from the second quarter of 2014, assuming they get regulatory approval. The problem is that many eastern U.S. ports have been preparing for the arrival of deep draft ships over 8,000 TEUs from the middle of 2015, when the new Panama locks were originally due to open, not the second quarter of this year, Drewry notes. The main east coast ports already handle vessels over 9,000 TEUs on Asian all-water services via the Suez Canal. However, inbound freight mainly consists of relatively low-weight consumer goods, and outbound ships have a significant number of empty containers, so maximum draft is never reached. On the trans-Atlantic route, by contrast, cargoes are made up of heavier industrial products and the trade is relatively balanced, which means inbound and outbound ships are well laden. A typical 8,000-TEU ship fully laden with heavy cargo has a draught of around 14.3 metres (47 feet) which, with under keel clearance, would require a channel depth of at least 14.9 metres (49 feet). Norfolk and Baltimore already have 50-foot-deep channels, and the Port of New York and New Jersey has also nearly completed its 50-foot dredging program. The remaining East Coast ports, however, would face challenges if the P3 and G6 carriers plan to deploy fully loaded 8,000-TEU ships by mid-2014, as their current channel depths range from 40 feet to 50 feet. Tides can ease the problem – in Charleston, for example, high water adds approximately 5.5 feet to the water depths. Other East Coast ports have a similar tidal range of around 6 feet, but the effect on permissible vessel drafts and tidal windows is “complex”, according to Drewry. These ports are at widely varying stages in their channel deepening projects. Miami expects to complete it 50-foot channel program by 2015, but Savannah, Jacksonville and Port Everglades are at least three years behind. This, in turn, will intensify pressure on landside operations, which already are under strain at several key East Coast ports. Speaking to Seatrade Global Tor Svensen, ceo of maritime for DNV GL, said: “Today I see energy efficient ships have become the norm, nobody goes and buys anything other than an energy efficient ship today.” He told seatrade Global. This is a change that has happened relatively quickly since the onset of the global economic crisis in 2008. “Gradually as it’s become the norm it has become difficult to compete and offer the charterer a non-energy efficient vessel,” he explained. One solution is to retrofit existing vessels to make them more energy efficient by methods such as installing a new bow and the fitting of Mewis ducts. “We see today that we are working extremely hard on helping owners on optimising their hulls. Our advisory group is working flat out on projects both on new designs, but also evaluating and retrofitting existing ships. This has become really a hot topic,” Svensen said. Interest has grown as owners have seen that retrofits do bring savings on fuel and therefore operating costs. But for container ships where fuel can be as much as 70% of operating costs Svensen noted, “better fuel performance can be the difference between profitability and a loss for your whole operation”. The Philadelphia Regional Port Authority (PRPA) is pleased to announce that its newly-released cargo statistics for 2013 again indicate not only a major increase in cargo tonnage compared to the previous year, but also the fourth consecutive year of double-digit cargo growth. Specifically, the maritime facilities of the Port of Philadelphia handled 5,100,385 metric tons of containerized and breakbulk cargoes in 2013, a healthy gain of over 15 percent compared to the 4,431,214 tons handled in 2012. Virtually all cargoes at the Port of Philadelphia showed gains, often large ones, last year. The world’s largest dry bulk carrier Oldendorff says it will opt for marine gas oil (MGO) in order to meet new 2015 emission regulations. The sulphur limit for bunker fuels in emission control areas (ECAs) will drop to 0.10% as of January 1, 2015. “The crucial factor in terms of our decision is that we’re a dry bulk carrier sailing tramp, a majority of which takes place between South America and Asia. If we were to pick a scrubber solution, it would be because one of our ships sails permanently within an ECA zone,” Jens Maul Jørgensen, head of bunker at Oldendorff, was quoted as saying. A recent survey conducted by the news provider revealed that a majority of carriers will be opting for MGO in order to comply with 2015’s regulations. U.S. crude oil refinery inputs averaged about 15.4 million barrels per day during the week ending November 8, 2013, 343 thousand barrels per day higher than the previous week’s average. Refineries operated at 88.7% of their operable capacity last week. Gasoline production rose from the previous week, averaging 9.4 million barrels per day. Distillate fuel production increased last week to 4.9 million barrels per day. U.S. crude oil imports averaged about 7.8 million barrels per day last week, up by 620 thousand barrels per day from the previous week. Over the last four weeks, crude oil imports averaged 7.5 million barrels per day, 7.5% below the same four-week period last year. Total motor gasoline imports (including both finished gasoline and gasoline blending components) last week averaged 446 thousand barrels per day. Distillate fuel imports averaged 130 thousand barrels per day last week. U.S. commercial crude oil inventories (excluding those in the Strategic Petroleum Reserve) increased by 2.6 million barrels from the previous week. At 388.1 million barrels, U.S. crude oil inventories are above the upper range for this time of year. Total motor gasoline inventories decreased by 0.8 million barrels last week, but are near the top of the average range. Finished gasoline inventories increased while gasoline blending component inventories decreased. Distillate fuel inventories decreased by 0.5 million barrels last week and remain near the lower limit of the average range for this time of year. Propane/propylene inventories fell 1.3 million barrels last week and are in the lower portion of the average range. Total commercial petroleum inventories decreased by 5.9 million barrels last week. The American shale oil boom has put the United States on track to overtake Russia as the world’s largest oil producer next year, according to the International Energy Agency (IEA). “With output of more than 10 million barrels per day (bpd) for the last two quarters, its highest in decades, the nation is set to become the largest non-OPEC liquids producer by the second quarter of 2014, overtaking Russia. And that’s not even counting biofuels and refinery gains,” the IEA said in a report released on Friday. Spectacular growth in shale oil production has also helped the US reduce its dependence on imported oil, to the extent that it has ceded its ranking as the world’s top net oil importer to China, according to recent US government data. The shift in global oil flow has set China on course to overtake the US as the world’s biggest buyer of oil from OPEC this year, and it may already have passed Russia as the world’s largest combined producer of oil and gas, according to a recent analysis of global data by The Wall Street Journal. Further enhancing US energy independence is the fact that its oil consumption has flattened out, while China’s oil use has been growing. Robust growth in American shale oil production will compensate for large disruption in OPEC production and provides a cushion for oil prices, Reuters reported. Without it, crude oil prices could have spiked much higher than the current levels of around $110 per barrel for the global Brent crude benchmark. OPEC crude supplies dropped below 30 million bpd in September for the first time in almost two years, due to steep sharp cuts in output from Libya and Iraq and despite Saudi output topping 10 million bpd. The IEA, the West’s energy watchdog, cut the “call” on OPEC oil by an average of 100,000 bpd for 2014 to 29 million bpd because of an upward revision in non-OPEC supply growth. A Harvard study has predicted that US crude oil production from shale formations could more than triple by 2017 to about 5 million bpd. Hess Corporation plans to sell its US East Coast and St. Lucia storage terminal network to Buckeye Partners for $850 million. Buckeye will acquire 20 liquid petroleum products terminals with total storage capacity of about 39 million barrels, the companies said in statements on Wednesday. All of the terminals are on the US East Coast, except for Hess’ Santa Lucia terminal in the Caribbean, which has a capacity of about 10 million barrels of crude oil and refined petroleum products. All but two of the facilities are marine terminals and 12 have deep-water access. Hess, a US-based oil and gas company, is reshaping its energy business to focus on exploration and production. It has sold assets worth $5.4 billion so far this year. In February, it shut its 70,000 barrel per day Port Reading refinery due to poor margins. The sale, which is subject to regulatory approvals, is expected to close before the year‑end. Buckeye purchased 33 refined petroleum products terminals and 650 miles of refined petroleum products pipeline from BP North America in 2011. Buckeye posted a net profit $76.4 million in the second quarter of 2013. The refining industry is committed to helping the International Maritime Organisation (IMO) conduct a low-sulphur fuel availability review “in a timely and scientifically sound way,” according to an industry spokesperson. According to MARPOL Annex VI, a study must be completed by 2018 to decide if a global 0.50% sulphur cap for marine fuels should be brought into force in 2020, or be delayed until 2025. Parts of the industry have been lobbying for the study to undertaken as soon as possible to give all parties involved in a clear signal about the deadline, partly because the lead-time required for refinery upgrades to produce more middle distillates will be longer than two years. But Brian Sullivan, Executive Director of the International Petroleum Industry Environmental Conservation Association (IPIECA), did not specify if IPECA thought the review should be pushed forward. “We believe it will be important to keep all options open to meet the Annex VI sulphur requirements,” he told last week’s Symposium on Sustainable Maritime Transportation held at the IMO’s London headquarters. That would include the use of scrubbers and alternative fuels, such as liquefied natural gas (LNG) and biofuels. Sullivan suggested that a study “a few years ahead of 2020” would provide a realistic view on the 2020 situation from the refinery side, as major refinery projects that will be completed and operational by 2020 will be formally announced, with engineering and/or construction underway. “Also by then, the outlook for scrubber penetration and the extent of the use of LNG by ships should be more reliable than any estimate that could be made today,” Sullivan said. “Furthermore, it will be important to review the potential environmental impacts from well to propeller, taking a system approach that includes the supply chain, equipment manufacturers and operators,” he added. “The free market will ultimately determine which mix of energy sources will be used to meet requirements in the most economical way. Note that the answer may not be the same for all types of ships,” he said. Despite this, observers at the IMO symposium took his statements to mean that the refining industry was not in favour of initiating the fuel availability as soon as possible, rather to hold out to get a clearer picture of other compliance options. The refining industry will need to undergo changes that are “unprecedented in scale within the industry” to meet global demand for middle distillate fuels when the global sulphur limit for marine fuels drops to 0.50%, according to an industry representative. The refining industry has met demand for lower sulphur fuels before for the road transport market, but these have been more manageable, Brian Sullivan, Executive Director of the International Petroleum Industry Environmental Conservation Association (IPIECA) told last week’s International Maritime Organisation (IMO) Symposium on Sustainable Maritime Transportation. Unlike the global sulphur limit for ships, due under the IMO’s MARPOL Annex VI regulation in 2020 or 2025, changes to road fuels have been made “step by step at a country or regional level,” Sullivan pointed out. He said the global marine fuel sulphur cap of 0.50% “implies a significant shift away from heavy fuel oil to middle distillate type of fuels,” which the refining industry, at present, would not be able to meet. Meeting this leap in demand for middle distillates would require additional conversion capacity, and ”significant additional upgrading investment” would be necessary, Sullivan told the symposium. “The changes required in the refining industry to provide 0.50% sulphur fuel will lead to a significant increase in refinery energy consumption and CO2 emissions,” he added. While the shipping industry has become increasingly energy efficient, the oil and gas production and refining industry became increasingly energy intensive during the 1990s, Sullivan noted. This was due to the increasing need to drill deeper to find and produce oil and gas, to use secondary and enhanced oil and gas recovery techniques, and to exploit heavier oil deposits and older reservoirs. In refining, CO2 emissions went up as the industry had to process greater volumes of crude, and converting more of that crude into light end products using energy intensive processes. “Even with these challenges, energy intensity in both the upstream industry and in refining has fallen significantly since 2007 and is now back to below the level of the late 1990s, thanks to significant investments by the industry in energy-saving technologies,” Sullivan said. Despite this, he reiterated the message that meeting the global sulphur cap would increase overall CO2 emissions from the refining sector. The US Environmental Protection Agency (EPA) has recently undertaken the first field checks to see if bunker suppliers in the US are providing low sulphur fuel oil (LSFO) that complies with the current 1.00% emission control area (ECA) sulphur limit. Samples have been collected from a handful of ports and suppliers in June and July, Matt Haber, who works at the US Environmental Protection Agency (EPA), Office of Enforcement and Compliance Assurance, told Bunkerworld in a telephone interview. He would not say which ports or which suppliers, but confirmed it was “more than one but less than 10”. These first field investigations have started after a long period of studying data, Haber explained. Suppliers have been targeted for closer inspection on the basis of information provided in so-called ‘Note of protest’ (NOP) documents concerning sulphur content that failed to satisfy MARPOL Annex VI provisions. Ship operators may issue a NOP if they find a fuel to be non-compliant according to test results, when the supplier’s bunker delivery note (BDN) suggests the fuel meets relevant sulphur limits. Haber told Bunkerworld that EPA encourages ship operators coming to the US to share the NOPs that they send to their respective flag administrations with US authorities. That way, the US gets information both on suppliers at home and abroad where the sulphur content stated on the BDN has been disputed. He said the NOPs involving US suppliers would be an indicator of where there may be problems, and that this would guide the EPA on where to put inspection resources. As such, the NOPs viewed by the EPA so far did play a role in deciding where the EPA sent inspectors to take fuel samples in June/July. Haber said the test results were not available yet as they were taken as part of a larger inspection regime that also involved testing fuels for the inland market. Nor are inspection results for on-going enforcement actions released to the public, he added. He said the EPA “may consider taking action” against suppliers found to be selling non-compliant fuels, but would not specify what the consequences might be. Haber stressed that the EPA would look carefully at all facts before deciding on the course of action. He said the EPA would look at the possible reasons for discrepancies between the sulphur content on the BDN and in test results obtained by ship operators. One question the EPA will be looking at is whether suppliers are blending fuels “right up to the limit,” which leaves no room for test uncertainties. As previously explained on Bunkerworld, test precision principles in ISO 4259 means bunker suppliers would need to use 0.94% sulphur as their blend target to be 95% certain that the fuel won’t exceed 1.00% sulphur in a subsequent laboratory test. The number of vessels claiming that they cannot find low sulphur fuel oil (LSFO) prior to entering the North American emission control area (ECA) is down by more than 70% compared to the period just after the ECA took effect. “We see this as a positive development,” Matt Haber, who works at the US Environmental Protection Agency (EPA), Office of Enforcement and Compliance Assurance, told Bunkerworld in a telephone interview. Vessels that are unable to source compliant LSFO prior to entering the North American ECA are required to report this to the EPA and authorities at the relevant port of destination, using the EPA’s Fuel Oil Non-Availability Report (FONAR). The ECA took effect on August 1, 2012 and during August last year the EPA received more than 100 FONARs. The number of FONARs stayed around that level for a while, Haber said. In April this year, Jeffrey Lantz, Director of Commercial Regulations and Standards, US Coast Guard (USCG) told a conference that the EPA had received approximately 750 FONARs in total. “We get fewer than 30 FONARs a month now,” Haber told Bunkerworld this week. He thought it was not only because of better LSFO availability in US ports, but also a result of more LSFO supply becoming available at key ports globally. The EPA and the USCG collaborate in enforcing the ECA provisions, including monitoring compliance with the current 1.00% fuel sulphur limit. The USCG monitors compliance onboard ships and does all the relevant checks for documentation, while the EPA decides on what civil penalties to impose in the event of non-compliance. Lantz, of the USCG, said in April that the EPA had yet to take any action against any of the vessels submitting a FONAR for ECA non-compliance. This is still the case, Haber confirmed. But he stressed that this does not necessarily mean that the EPA has accepted all the FONARs at face value. “Our approach is to look at large sets of data and identify problem areas,” Haber told Bunkerworld. The FONAR must provide evidence that the vessel made a “good faith effort” to purchase compliant fuel. While there are many legitimate FONARs, the EPA is still analysing reports and will be looking for patterns suggesting abuse, according to Haber. Operators that make repeated use of FONARs are likely to come under particular scrutiny if the EPA suspects they are taking advantage of the non-availability clause in MARPOL Annex VI. Although no action has been taken against operators submitting FONARs as yet, if the documentation doesn’t pass muster with the EPA, they shouldn’t feel too safe. The Panama Canal Authority is studying the construction of a fourth set of new locks that would accommodate super post-Panamax vessels, which would run parallel to the third set of locks currently under construction, as part of its $5.2 billion expansion project, according to Breakbulk, JOC’s sister publication. The current Panama Canal expansion, scheduled for completion in June 2015, will accommodate post-Panamax vessels. US barge operator Kirby Corporation posted higher earnings during the second quarter (Q2). The firm recorded net profit of $63.1 million in Q2 2013, compared to profit of $47.6 million during the same period in 2012. Its marine transportation and diesel engine services saw combined revenue of $564 million during Q2 2013, higher than revenue of $511.9 million in the same period last year. “Our second quarter results benefited from continued strong demand and favourable pricing in our inland and coastal marine transportation markets,” said Joe Pyne, chairman and CEO of Kirby. “We were also able to manage through the high water and lock closure issues with only an estimated $0.03 per share negative impact.” The closure of the Algiers Lock due to structural damage during Q2 created heavy congestion and multi-day delays in the New Orleans area, and also resulted in delays at the Bayou Sorrels and Port Allen Locks, noted Kirby. “Our land-based diesel engine services market remained weak. However, there are signs the cycle has bottomed,” added Pyne. The land-based diesel engine services segment saw continued weakness in demand for pressure pumping units, land-based engines, transmissions and parts. Kirby noted large service projects for inland and coastal customers, as well as service work for international drilling rigs in the marine diesel engine services market. The firm expected to post increased earnings for its outlook in the remaining year. “Our earnings guidance for the 2013 third quarter is $1.05 to $1.15 per share compared with $0.95 per share reported for the 2012 third quarter,” said Pyne. “For the 2013 year, we are raising our guidance to $4.15 to $4.35 to reflect the net effect of the earnout credit and the impact of the high water and lock issues. This compares with $3.73 per share for the 2012 year. The OPEC Reference Basket averaged $104.45/b in July, representing a gain of $3.42/b over the previous month. The increase came mainly from Brent-related North African grades, as well as Middle Eastern crudes. The Nymex WTI front-month contract gained a hefty $8.90/b in July to average $104.70/b. Positive US economic data coupled with US crude inventory draws attracted speculative flows back into the US crude futures market. Managed money net long positions rose to the highest level since the CFTC began publishing weekly disaggregated data in September 2009. ICE Brent was supported by supply disruptions, although the upward price trend was partly offset by higher US shale supplies and worries about weaker Chinese demand. World economic growth for 2013 has been revised down to 2.9% from 3.0%, mainly due to lower GDP growth estimates for the US in the first quarter, as well as the slowdown in China’s economy. The 2014 global growth forecast remains unchanged at 3.5%. US growth in 2013 has been revised down by 0.2 percentage points (pp) to 1.6% and remains at 2.5% in 2014. The forecasts for the Euro-zone remain unchanged, with a contraction of 0.6% expected this year and growth of 0.6% in 2014. Japan’s growth for this year has been revised up to 1.9% from 1.8%, given the continued momentum, but is still expected to slow to 1.4% in 2014. India and China are currently impacted by decelerating total investments and declining exports. Growth for China has been revised from 7.7% to 7.6% this year and remains at 7.7% in 2014. India’s 2013 and 2014 growth expectations are unchanged at 5.6% and 6.0%, respectively. World oil demand growth in 2013 was revised marginally higher to stand at 0.8 mb/d. The revision is based on actual and preliminary data for the first half of the year, due to adjustments to all of the OECD regions, as well as some in the non-OECD, especially Latin America and Other Asia. The forecast for global oil demand growth in 2014 remains unchanged at 1.04 mb/d. Non-OECD countries are projected to increase by 1.2 mb/d, while OECD is expected to see lower contraction at 0.2 mb/d compared to the current year. Non-OPEC supply is expected to rise by 1.0 mb/d in 2013, following a minor upward revision, mainly due to historical revisions, as well as higher-than-expected US output. In 2014, non-OPEC oil supply is forecast to grow by 1.1 mb/d, supported by projected increases in the US, Canada, Brazil, the Sudans, and Kazakhstan. OPEC NGLs and nonconventional oils are projected to increase by 0.2 mb/d in 2013 and 0.1 mb/d in 2014. In July, total OPEC crude oil output averaged 30.31 mb/d, according to secondary sources, representing a drop of 0.10 mb/d from the previous month. Product markets exhibited a mixed performance in July. In Asia, refinery margins remained relatively healthy as cracks strengthening across the top and middle of the barrel, supported by the strong regional seasonal demand. In contrast, refinery margins in the Atlantic Basin fell pressured by development in the crude markets. The bottom of the barrel crack spread suffered a sharp drop across the global, caused by weaker demand in both the bunker and power sectors. In the tanker market, OPEC spot fixtures in July averaged 14.35 mb/d and OPEC sailings stood at 24.36 mb/d. Arrivals at most reported routes increased, except in west Asia which declined by 3%. Dirty tankers spot freight rates increased on higher activity and tighter tonnage availability for certain dates, as well as various port delays. Suezmax experienced the highest gains. Clean spot freight rates were mixed, with east of Suez spot freight rates down 12%, while west of Suez rates increased by 8% from a month ago. Total OECD commercial oil stocks rose by 13 mb in June for the fourth consecutive month, but remained slightly below the five-year average. Crude stocks were in line with the five-year average, while product inventories showed a deficit of 6.4 mb with the seasonal average. In term of forward cover, OECD commercial stocks stood at 59.1 days, 1.2 days more than the five-year average. Preliminary data for July showed US total commercial oil stocks fell by 8.1 mb, reversing the build of the last fourth months, but still representing a surplus of 29.7 mb with the five-year average. Crude and products showed a surplus of 21.9 mb and 7.8 mb, respectively. The demand for OPEC crude in 2013 is forecast to average 29.9 mb/d, almost unchanged from the previous report and 0.4 mb/d lower than in the year before. In 2014, demand for OPEC crude has experienced a slight change since the previous report to stand at 29.7 mb/d. This represents a decline of 0.3 mb/d compared to the year before.